Jacksonville’s budget-friendly amenities will help you enjoy 3 days on the North Carolina coast, exploring local charm, beaches and patriotic history. Jacksonville’s story starts more than 300 years ago, when it was a humble but productive port at the mouth of the New River. Through the years, this Eastern North Carolina city has been shaped by a growing military population that now includes nearly 50,000 Marines at Camp Lejeune. Patriotism is part of the fabric of Jacksonville, and its natural beauty and proximity to beaches make it an all-around welcoming place when you visit. Awaken your senses at veteran-owned The Milk Road, where local art covers the walls and coffee beans roast. Order a favorite or try something different such as the Shakerado. It’s slightly sweet and served in an ice-filled Boston shaker. Don’t pass on its liège waffles, whose yeast-risen dough is studded with pearl sugar. It caramelizes during cooking, creating a sweet crunch that makes syrup unnecessary. 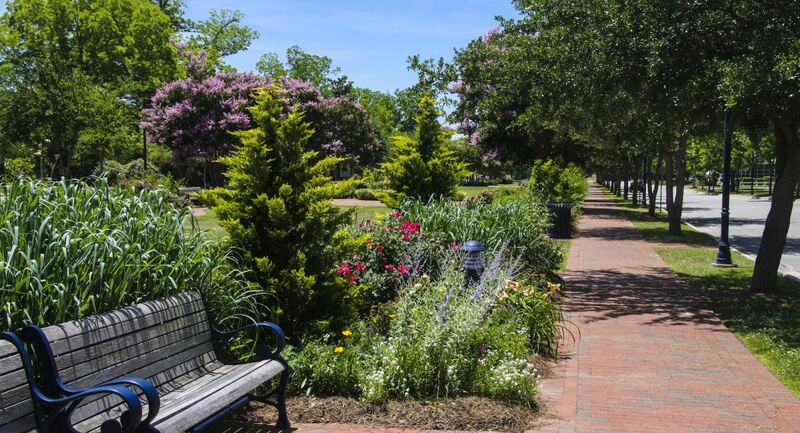 While it’s easy to dawdle on The Milk Road’s patio, get exploring Jacksonville’s nearly 20 miles of paved trails and greenways that connect downtown parks and city sights. Download a map and put on your walking shoes or hop on your bike. The trails are safe, free and pet-friendly. One pet with a citywide reputation is Jo Jack the parrot, Marina Café’s mascot. Meet him while enjoying a casual seafood lunch riverside. Start by splitting the Carolina Coastal crab dip before enjoying a fried flounder or soft-shell crab sandwich. Or add grilled tuna to one of the many salads that join other traditional lunchtime offerings on the menu. 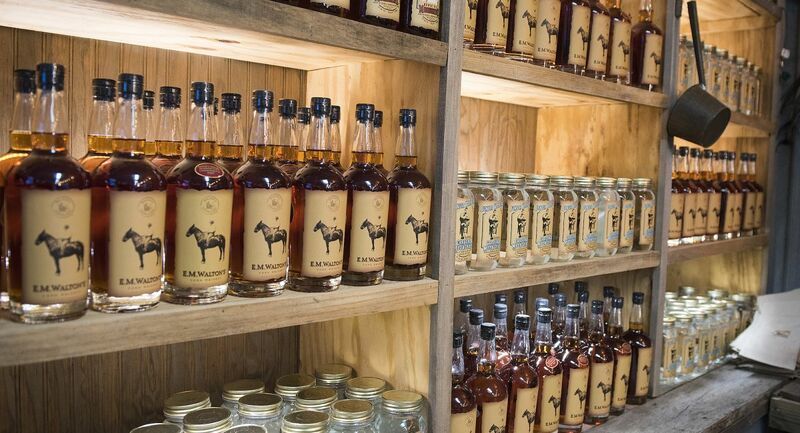 You’ll need to drive (or catch an Uber) to family-owned Walton’s Distillery. With its free tour and sampling in the gift shop, you’ll spend about 2 hours at this stop. Its oak-aged E.M. Walton’s Corn Whiskey, named after the owner’s great-grandfather, is smooth, but there’s a kick to its moonshine, made from a bootlegging cousin’s recipe. If the original is too strong, try the apple pie, peach or other flavored varieties. Sample other liquors, wine and beer distilled in North Carolina when you order the 5-course tasting menu at Duck’s Grille and Bar. The tasting events are usually offered the last Thursday of the month; reservations are required. The chef fills the daily menu with dishes that range from vegetarian garden risotto to certified angus filet mignon. Entertainment – bands, karaoke and comedy – changes nightly. In addition to many free and inexpensive activities, Jacksonville offers several lodging options, from campsites to new, nationally respected chain hotels for less than $100 per night. Order breakfast at Central Café, a cozy downtown diner with thick-cut bacon and easy-flowing coffee. Everything is made to order, from the sweet blueberry pancakes to the spicy pepper steak omelet. Remember your free cookie when you leave. Head around the corner to Lejeune Memorial Gardens and walk among touching memorials that honor Americans who made the ultimate sacrifice. 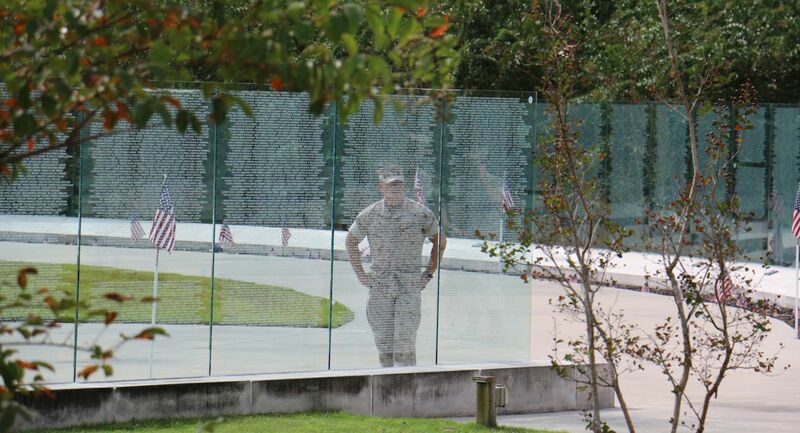 Its Vietnam Memorial, for example, is the nation’s second largest and lists those missing, taken prisoner or killed in the war. The Beirut Memorial honors the 220 Marines killed in a 1983 attack that’s considered the start of the War on Terrorism. And the 9/11 Memorial is built around a World Trade Center girder that was delivered by a New York City fire engine. Stop for lunch at Jeff’s Burgers, Dogs and Shakes, which serves hot dogs on toasted rolls and forms its burgers by hand. Its Paul Parker sandwich – roasted pork loin, bacon, Cheddar crisped on the flattop, lettuce, tomato and mayo – is legendary. Add hand-cut fries or onion rings and a handmade milkshake, and you’ll know why Southern Living magazine called it a must visit. You also must visit the beach, with two great options only a 30-minute drive from Jacksonville. Head north for an afternoon in the historic fishing village of Swansboro and Hammocks Beach State Park, one of the state’s best spots to search for seashells. April through October, a short ferry ride will take you from the mainland section of the park in Swansboro to Bear Island. 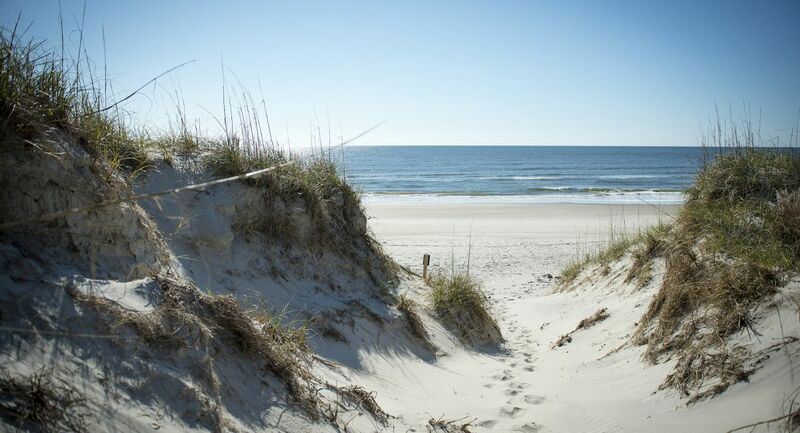 Or travel south from Jacksonville to North Topsail Beach for soft sand and quiet waters. Return to Jacksonville in time for dinner at Marrakesh. From stuffed grape leaves to lamb chops and moussaka, you’ll find an authentic Mediterranean experience, complete with belly dancers on select evenings. Looking for the hometown favorite where locals go for breakfast? Head uptown to Kettle Diner, just one place where you can enjoy a hearty meal for a reasonable price. Its menu includes omelets, breakfast burritos and French toast, and breakfast starts at 6 a.m. An early start to your day is important (okay, sleep in until 8 a.m.). Built in the early 1940s, Marine Corps Base Camp Lejeune uses much of the coastline in Jacksonville to train and practice amphibious landings. But, the ocean, rivers and creeks also welcome kayakers and canoeists, especially early in the day when the air is cool and boat traffic is light. Launch your kayak from the beach at Jacksonville Landing, which has three boat ramps and a fishing pier. If you don’t own one, take Paddle NC’s 2-hour Eco-Tour. Patient guides teach the basics before leading you on a trip down a New River tributary. Watch for wildlife. You’ll likely see ospreys, both the large fish-eating feathered raptors and the tilt-rotor aircraft from Marine Corps Air Station New River. Mission BBQ is standing-room-only at noon, when the national anthem is played as a daily salute to country, military and first responders. It’s serious about barbecue, too. While its brisket sandwich is a popular lunch choice, you can order smoked chicken, pork or turkey. If you can’t decide, ask your server for the sampler and create your own combos with sauces from around the country. You can’t leave Jacksonville without a souvenir. Choose from plenty at shops inside Jacksonville Mall and along Western Boulevard. Save time for Saigon Sam’s Military Surplus, where you’ll find outdoor gear and clothing. And She Swank Too apparel boutique’s unique items are popular with moms and daughters. 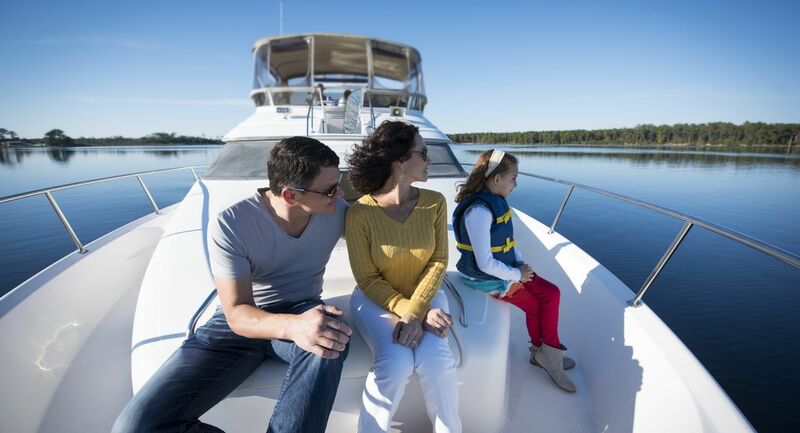 A sunset dinner cruise is a charming way to end your Jacksonville visit. Let Capt. Lance Ledoux – a retired Marine who did three tours at Camp Lejeune – and his wife, Marilyn, take you on their private yacht, Bayonet. The 3-hour voyage includes beverages, hors d’oeuvres, including the captain’s famous shrimp cocktail, dinner, dessert and a spectacular view. This trip idea was produced in partnership with Jacksonville Tourism Development Authority.